It’s finally vacation time and you’re ready to pack your gear and go. 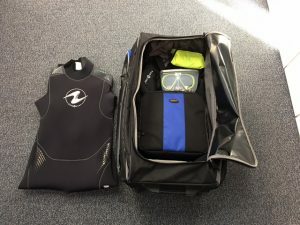 One of the questions we routinely get is what’s the best way to pack my scuba gear? 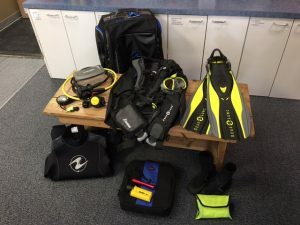 Here are some packing tips on how to protect your gear as well as making sure you have everything necessary for a successful dive trip. Service isn’t generally a fun thing to spend money on however, remember that your regulator is a life support system! Be smart and make sure your gear is in proper working order before you pack up and go. Write a list out of everything you think you’ll need for the trip. Then narrow the items down where possible. Lay all you gear out where you can see everything. That way you know you have it. When you pack it, cross it off the list. Don’t use old heavy luggage that isn’t designed for scuba gear! Those bags tend to be heavy and scuba gear doesn’t fit properly. There are a number of high quality scuba travel bags available from various manufacturers. They are light in weight and designed to fit and protect your expensive scuba gear. Be smart about what you plan on taking and where you are going. 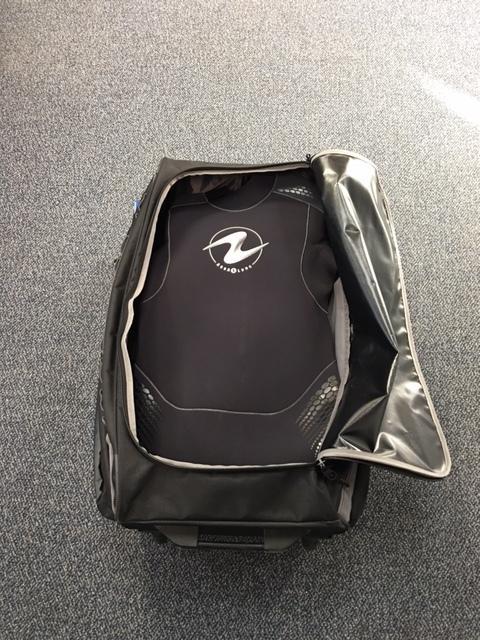 It might be time to ditch that heavy Zeagle Ranger BCD for a lightweight travel BCD such as the Aqualung Zuma or the Cressi Travelight BCD. Both items can take a good 4-6 pounds off your total luggage weight. Another items is fins. It may be more appropriate to leave your large open heel fins and neoprene booties behind for a nice pair od full foot fins. They are smaller, lighter, and there is no need for the booties. This will also decrease your luggage weight! You should always have some sort of “save a dive kit”. Mask straps, fin straps, etc. always seem to break at the most inopportune time! Don’t miss out on a dive because of one of these $5 items. Bring a spare mask if you use a RX mask. RX masks are not generally available for replacement at most dive destinations. Especially if you have a custom prescription. Here is the process how we pack our scuba gear. Fins – Place your fins in their side fin pockets. This will also help protect the rest of your gear. Booties – If you are bringing booties put them on the bottom of the bag below the BCD. Regulator – Pack your reg in a regulator bag and place it inside the BCD (you can also carry it on). Mask – Your mask is important! Especially if you have an RX mask. 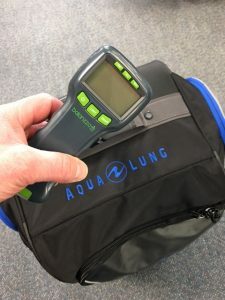 Pack it in a protective mask box then place it in the BCD above your regulator. Lights – pack your lights with the batteries installed. It is a good idea to also pack them in a regulator bag or some type of padded bag. Surface Marker – It is always a good idea to have one of these. Especially if you will be drift diving! Place this towards the top. 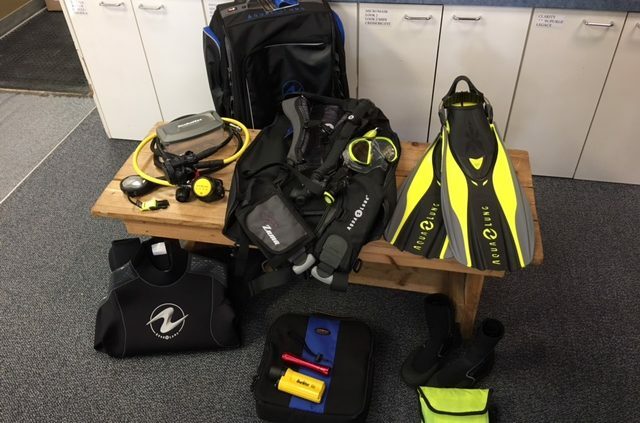 Save a dive kit – Yes. Pack a small “save a dive kit”. This should include a mask strap, fin strap, mouthpiece, zip ties, small scuba tool, and ear drops. Wetsuit – Put your wetsuit over the top of everything else. This will add more padding for your gear. Weigh it – When you’re all done weigh your bag. It should not exceed 50lbs. There are many ways to pack gear. We at Aquaventure Dive & Photo Center find this to be the most reliable method on protecting your gear and getting everything to your destination safely!